Northants have secured the signing of Nottinghamshire seam bowling all-rounder Brett Hutton on a three-year contract. The 24-year-old has put pen to paper on a three-year deal at County Ground. Yorkshire-born, Hutton has spent his entire career to date at Trent Bridge, and was Notts’ leading wicket-taker as they pipped Northants to second place and promotion from the Specsavers County Championship Division Two. He claimed an impressive 37 wickets in nine appearances for Notts in the four-day game, with six of them coming as his team lost to Northants at the County Ground last week. With the bat, he has scored 970 runs at 21.55, with a highest score of 74. He has only been used sparingly in white-ball cricket, playing just nine 50 overs games and one T20 match through his time in Nottingham. Hutton said “I want to thank Notts for everything they’ve done for me. 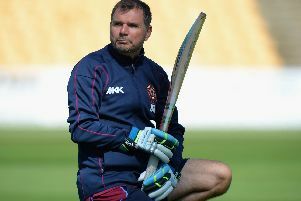 Northants head coach David Ripley said: “We are delighted to welcome Brett to the club. “I’ve been particularly impressed with his desire to improve and seek more opportunity away from what is obviously a very fine club in Notts. A right-arm bowler and right-handed batsman, also Hutton represented England Under-19s in the 2012 World Cup in Australia where he took five wickets in four games. He went on to play 17 matches during his time with the England U19s, taking 20 wickets in total.